PGA Tour — Rory McIlroy got caught by the sting in the tail they call the Green Mile in the Wells Fargo Championship but confessed he was pleased with his putting after seeking advice from Dave Stockton for the first time in over a year. The 26-year old World No 1 made at Quail Hollow look deceptively easy as he hardly moved out of second gear and played his opening 16 holes in four under par to move within touching distance of the lead. Six birdies and two pretty innocuous bogeys moved him quickly into contention until he misjudged the wind slightly and came up short in the water at the 178-yard 17th, where he missed an eight footer for bogey after a drop. McIlroy confessed that he was a little disappointed with the way he finished, carding a two under 70 to end the day tied for 30th with Pádraig Harrington, who had four birdies and two bogeys. 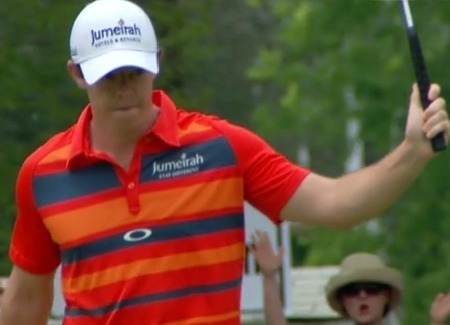 McIlroy did putt well but hoped to do better in round two. “I’ll go out tomorrow with good greens and hopefully shoot a bit lower,” he said, adding that Stockton had given him a few tips earlier in the week that seemed to help him following a frustrating week judging speed in The Players. American Robert Streb shot a seven under 65 to lead by a stroke from McIlroy’s playing partner Patrick Reed and Kevin Chappell, who both shot 66. European Tour — Michael Hoey was the only Irish player to break par as an opening 65 put Trevor Fisher at the top of the leaderboard in the Open de España at Real Club de Golf El Prat in Catalonia. Hoey shot a one under 71 to share 30th with Peter Lawrie (74) tied 82nd and Damien McGrane (76) tied 117th. After a long flight from Johannesburg on Monday, Fisher only managed nine holes of practice on Tuesday before walking the rest of the course during the pre-tournament pro-am. However, that did not prevent the World Number 172 from carding eight birdies and just one bogey in an opening 65 which left him one shot ahead of local favourite Eduardo de la Riva, compatriot Darren Fichardt and England's Tommy Fleetwood. Europro Tour — Alan Dunbar remains in front in the World Snooker Open at Celtic Manor after the second round was abandoned due to flooding on the Montgomerie Course. In line with PGA EuroPro Tour Regulations, a cut to the leading 50 players and ties was made and they will play a further 36 holes on Friday, allowing the tournament to be completed over 54 holes. The decision means Stephen Grant (70), Tim Rice (73), Richard Weldon (75) and Brian Casey (80) were cut. Dunbar shot a seven under 62 on Wednesday to lead by two shots with Richard Kilpatrick and Mark Murphy tied 13th after 66s and Simon Ward (69) tied 46th. Web.com Tour — West Waterford’s Seamus Power is tied for 19th after opening with a five under 67 in the BMW Charity Pro-Am Presented by SYNNEX Corporation at the Thornblade Club in South Carolina. Following an early bogey at the fourth, Power birdied the seventh, eight and 12th and followed an eagle three at the 15th with a birdie at the 16th before dropping another shot at the 18th. A pro-am played over three courses, Australian veteran Rod Pampling shot a nine under 63 on the The Reserve at Lake Keowee to lead by two shots from Jason Allred and Si Woo Kim. Rory McIlroy is a big fan of the Dan Patrick Show, a US sports radio show hosted by (correct) Dan Patrick. The world No 1 reversed the charges from London, where he made an appearance at Nike Town following his arrival from his record setting 11th PGA Tour win in the Wells Fargo Championship at Quail Hollow on Sunday.